I grew up with role-playing games. Many of my high school and university years were whiled away at a friend’s house rolling dice, eating Cheetos and, most importantly, telling stories. I don’t regret it one bit. When I move to Japan I spent some time playing computer RPGs but it never quite fills in the gap that interacting with others leaves behind. After a bit of searching I discovered MUs. These are text-based games that you write, in real-time, with other players. Thing of it like the proto-types of Second Life and World of Warcraft without the graphics. It was on one of these games that I met my best friend, and this painting is for her birthday. It’s of a pair of our characters, Octavia (mine) and Corina (hers). Octavia the young wife of an exiled Roman senator and Corina is her personal slave. They are both the same age and Corina was bought for Octavia on her thirteenth birthday. Breaking down under the stress and shame of her husband being caught with the Emperor Augustus’ daughter and then exiled, Octavia eventually attempts to slit her wrists. Corina attempts to save her and runs to the Temple of Vesta for help. A Vestal Virgin arrives just as Octavia’s beginning to slip away. She can’t save her, but instead she turns Octavia into a vampire. This image is what happens after Octavia awakens after her transformation. She realizes what she has become and in a wave of hunger and longing she decides to do the same to her slave. After all, that way they can be together for all eternity. Corina, however, is less impressed with having to serve her Mistress forever. The story then revolves around the next two thousand years as the pair try to come to terms with what they are and who they are to each other. I knew that I wanted the image to be framed, much like my inked Diana drawing that I did earlier last year. I wanted to evoke the feeling of containment in the Second Style Roman wall paintings. 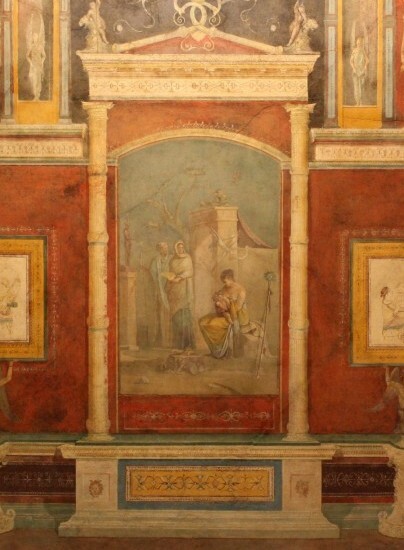 Fresco from the Villa of the Farnesina, Rome. I found a stock image from DeviantArt that was just perfect and then also scanned some design elements like the column tops and the rose pattern from an old book that I picked up in a used book store in Tokyo this past April. Working in Photoshop I patched all the bits together into a composition that I liked, checking out the overall balance with a golden mean template. Once I had that all worked out, I started on the sketch itself. This isn’t the final piece, just the basic drawing to work out the line-art, shadows and composition etc for the watercolour painting that this will become. 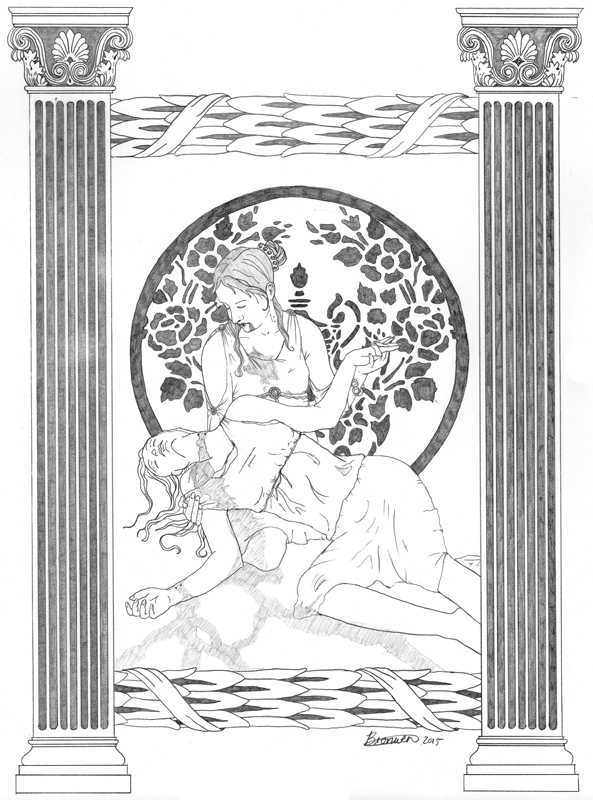 Once I had the sketch done I sent to over to fantasy artist, Angela Sasser, for a red-line critique. She did a private video of her critique for me, drawing over my digital image and showing me how to improve on the composition, anatomy and over-all finesse of the piece. The stuff that she came up with completely blew me away. So, now it’s back to the drawing (well, Photoshop) board again to rework the composition. Hopefully you’ll like how it turns out the second time around.